Criminal investigations special agents (CIDs) are sort of like the gumshoe detectives of the U.S. Army. CID special agents are responsible for investigating or supervising investigations of felony-level criminal allegations or offenses against Army personnel or property. Think of the Tom Cruise and Demi Moore characters in the movie "A Few Good Men" (although note that they were Marines, not Army). The Military Occupational Specialty number for this job is MOS 31D. CID special agents can expect to investigate such criminal activity as espionage, treason, and terrorism. Like a police detective, they'll interview witnesses, question suspects and collect and analyze both forensic evidence and criminal intelligence. They're also responsible for maintaining Army criminal records. Job training for a CID special agent requires 20 weeks of a resident course, where recruits will learn about civil and military laws, investigation procedures and techniques, how to process a crime scene, and how to present testimonial evidence. Prior to being accepted into CID special agent training, recruits should have an interest in law enforcement. Recruits who want to become a CID special agent should be able to make quick decisions and remain calm under heavy duress. To qualify for the CID special agent training, recruits need a 102 in the Skilled Technical (ST) area of the Armed Services Vocational Aptitude Battery (ASVAB). They should be eligible for secret security clearance. While there's no specific strength requirement for MOS 31D, recruits must have normal color vision and be able to speak and write clearly. They should expect to be able to conduct interviews, ask questions to get information from unwilling sources and be confident presenting information when testifying. Upon application, a potential CID will need at least two years but not more than 10 years of service in the Army. Other requirements for this job include six months' experience in either the military police or a civilian police force or completion of an apprentice special agents course. Applicants must complete the 31B military police one station unit training (OSUT) and the CID special agent course (CIDSAC). Since the nature of the work they do is highly sensitive and has legal implications, the Army is strict about the qualifications and is unlikely to offer waivers to any of these conditions. Before enrolling, CID candidates must be U.S. citizens, and be at least 21 years old, and have two years of college. They have a maximum rank of sergeant. The 31D criminal investigations special agent pilot program is open to applicants for the MOS 31D. 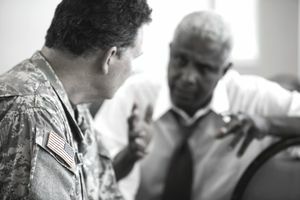 To qualify for the pilot program for MOS 31D, candidates need a bachelor's degree in criminal justice, forensic science, computer science, or pre-law. They'll need a grade point average of 3.0 or higher. Those who are ineligible for this position include anyone with a record of psychological or pathological personality disorders, anyone with an unsatisfactory credit record, and anyone with civil court or court-martial convictions. Candidates will be subject to a single scope background investigation (SSBI) which will examine character traits such as integrity, sobriety, discretion, and stability.